We tend to consider it simply as a natural cosmetics label, or yet another one, one among others, or even as a label for German cosmetics… But NaTrue is actually much more than this. 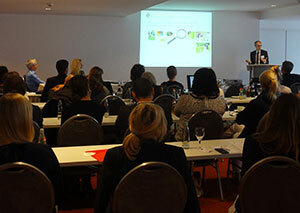 CosmeticOBS was invited to the annual general meeting of this association last May 22, 2015, in Berlin. Find out about it here. Both an overview of the work done since its origins and a presentation of its visions and strategies for the future were on the agenda of this annual general meeting. NaTrue opened the doors – and debates – to CosmeticOBS in full transparency, with a main objective: make more people get familiar with the association, and possibly clear up a few lingering misconceptions about it, in particular in France. CosmeticOBS did raise this issue when it conducted a survey of its web users on organic cosmetics between January 5 and February 2, 2015: only 22% of respondents had declared they knew the NATRUE label, 32% they did not know what it corresponded to, and 39% they had never heard of it (see our article on this topic). And yet, this label was created eight years ago, and since then it has been appearing on an increasing number of cosmetics products. However, if NaTrue declares 80% of natural and organic cosmetics bear its logo in Europe, only 4% do in France. Of course, from the very beginning, the NaTrue label was intended for the global market. And if it was first identified as a German logo (the first brands to adopt it were German or Swiss), it widely spread elsewhere, year after year. Today, as ‘Label Manager’ Francesca Morgante explained, 4,300 products of 160 brands are NaTrue-labelled. And this year, for the first time, less than 50% of them are German, and 17% non-European. The label has strongly developed over the last two years in Eastern European countries and as far as Russia, Asia, or Australia. Its prospects are promising: all in all, NaTrue plans to have 1,100 more products of 280 brands certified by the end of 2015. 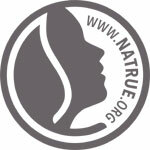 NaTrue has chosen to be organized as an association, and claims it does not aim to make any profit (its financial results are there to prove it: in 2014, the seal fee for raw materials declined from €200 to €50, while the label fee for finished products was reduced to €200, compared to €300 in 2013), but really to promote the quality and availability of natural and organic cosmetics. This implies to regularly adapt the standard’s criteria, for example, to take into account both technical progress and consumer expectations. Similarly, NaTrue now relies on the IOAS (International Organic Accreditation Services), an independent certification organization, to guarantee these criteria are satisfied and gain more credibility as a label. 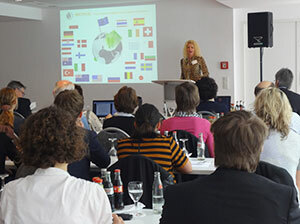 Today, the association counts 34 members of 24 different nationalities. 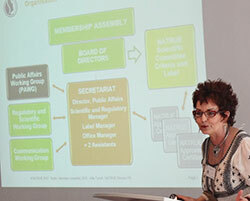 It is presided over by Klara Ahlers and managed by a Board of Directors that has just been renewed for two years. 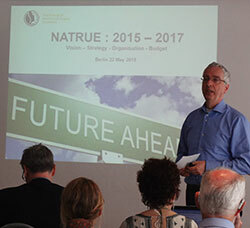 Vice-President Hans Nijnens presented the NaTrue ‘vision’ for the next two years. It is the second pillar that is presented as the most important. NaTrue clearly highlights its lobbying action in Brussels and aims to reinforce its role as part of the European Commission’s working groups or standardization bodies like the CEN. Even if the association cannot vote (only Member States representatives are entitled to do so), it can make itself heard and is considered an essential partner. NaTrue Director Julie Tyrrel has got a favourite playground: Brussels. To present her own role, she first mentions regulatory monitoring, the best way to learn what is underway to better try and have an influence on it. Indeed, today, several regulations under preparation are raising concerns among natural & organic cosmetics players. There is still no ‘official’ definition of what a natural or organic cosmetic product is today. However, some might be published soon, and the challenge for the NaTrue association is to make these definitions correspond to its own vision. Article 20 of Regulation 1223/2009 focuses on cosmetics claims… which may include the ‘natural’ or ‘organic’ claims in the future. NaTrue participates in the discussions of the European Commission’s working group. Discussions are continuing with standardization bodies to come up with a text entitled Guidelines on technical definitions and criteria for natural and organic cosmetic ingredients and products. The first part dedicated to the definitions of ingredients has been finalized, but not the second one, which is to determine the criteria applicable to ingredients and finished products. NaTrue sits on the ISO TC 217 WG 4 and CEN TC 392 IN 2014 working groups, and what is taking shape raises particular concerns for the association. ‘The problem,’ Julie Tyrrell explained, ‘is that this text can be used as a mandatory standard at the European level.’ This means the definition adopted for a natural and/or organic cosmetic product might be reduced to basics. Therefore, they are said to be exerting pressure to make requirements less strict. ‘What about consumer expectations then?,’ Julie Tyrrell asked. NaTrue tried to strengthen its arguments by having a study conducted by a market research expert, the GfK Group, in 2014 (see our article on this topic). And it appeared that 80% of consumers expect natural products to only contain natural ingredients, and no GMOs (for 90% of the people surveyed), while the standard might actually leave some room for them, as well as for non-natural petrochemical ingredients… and these are only a few examples. So, to make itself heard, NaTrue has set up a communication plan targeting European deputies who, according to Julie Tyrrell, really welcomed the association. And as long as the final definition has not been adopted, it will pursue its lobbying efforts. The association does not intend to come to meetings empty-handed: it relies on the work done by its scientific division managed by Mark Smith. What is its role? Monitoring draft regulations, analyzing their impact on ingredients and natural cosmetic products, and providing arguments to emphasize and defend their quality, including by carrying out specific research work – which has already proven quite successful. As an example, in the sector of essential oils, NaTrue has contributed to IFRA decision to allow the re-evaluation of all existing newly received data. And here is another major contribution to the defence of natural ingredients: NaTrue’s data on the safety evaluation of peanut oil, threatened to be banned due to its possible allergenic potential, were accepted by the SCCS, which took them into account to r eview its first Opinion and modify the protein level acceptable for a cosmetic use. NaTrue’s research work is not limited to defending what already exists. Mark Smith’s team has already contributed to a study project to develop a surfactant derived from renewable sources that could be considered natural and organic-certified. The concept was promising, although it failed because of its cost and the stability and supply problems it might have caused. But this is just the beginning, and Mark Smith’s work programme has quite a lot of subject matters to deal with for the years to come. So here is what lies behind the NaTrue label. Now, the association still has to communicate about its actions on a more global level to get better known from the public at large. This is part of its next objectives, and to this aim, it has already revamped its website. Of course, it contains details about the standard’s criteria, all the products labelled with explanations on their level of certification, but also specific pages aimed at the general public, manufacturers, and the media, as well as practical information sheets related to political, scientific, and regulatory issues.